“Fruitvale Station” is based on a true story. I didn’t know that before I saw it, given that I am an idiot who sometimes forgets to read the news. It’s not necessary to know the story before you see it, but some knowledge would definitely help. In short, “Fruitvale Station” is about a standoff between some Bay Area cops and a few young black men at a train station in Oakland that ended in a tragic death. That is just a short answer to what “Fruitvale Station” is about, and an answer that does not really give it justice. It’s about the last day in the life of Oscar Grant (Michael B. Jordan), which also happened to be on the last day of 2008. It is also about humanizing the dead and finding empathy by creating context. Oscar’s final day is filled with little moments that normally wouldn’t mean much in terms of one’s entire life. However, they mean the world in someone’s final hours. Oscar had been in and out of jail many times. He is constantly marred by financial woes and an inability to stay out of trouble. Despite his criminal nature, Oscar can best be described as a family man. He loves his girlfriend Sophina (Melonie Diaz), even if he drives her crazy. He’ll pay for his mother’s (Octavia Spencer) birthday dinner even when he’s broke. Most importantly, he makes sure to send his young daughter Tatiana (Ariana Neal) to private school. 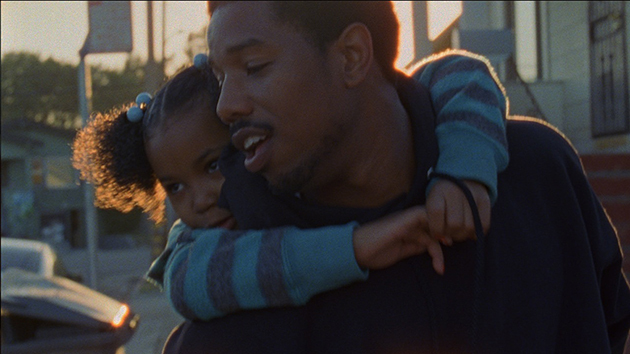 “Fruitvale Station” moves slowly, but it is full of those small, important defining actions. A scene where he personally helps a customer on his off day at his supermarket job may seem like a detour, but it shows his surprising amount of caring, even for strangers. It is all subtle buildup (saying it is manipulation wouldn’t be fair) for what’s to come. This is a film that definitely creeps up on you and makes you put your defense down because it is a surprisingly warm film throughout. It celebrates culture and family. First time writer and director Ryan Coogler nails everything from the dialect to the food in such a detailed way that you would have sworn that he had lived in the Grant household and followed Oscar around the streets of Oakland for most of his short life. As Oscar, Michael B. Jordan gives life and love to Coogler’s script. Even when he’s doing something nasty, there is always a compassion in Jordan’s demeanor that makes it so easy to instantly forgive Oscar. No matter where the film took me, I never wanted to turn against him. 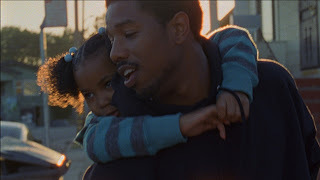 Unfortunately, “Fruitvale Station” is painfully short. I say painfully because I know that there was so much more story that could have been filled in before, in between, and after. While the film is just meant as an encapsulation of one day in Oscar Grant’s life, it felt like there was a lot more going on below the surface that it neglected to bring up. Perhaps Coogler felt that bringing too much up would hurt the film, which is meant to simply glance at all of the events as is. Yet, “Fruitvale Station” doesn’t feel completely objective. There are certain points in the film where it feels like the fly leaves the wall to start picketing. Now, there’s nothing wrong with a film having a strong social message. However, debates that deeply explore the merits of both sides tend to be much more interesting and thought provoking. A scripted film should never be a PSA. Even if you agree with the point a film is making, it is hard to enjoy when it feels like you’re being preached to. If you want to see a film that expounds these ideas even further, watch “American History X” instead. “Fruitvale Station” would be a little more like a modern “Do the Right Thing” if it asked the right questions. “Fruitvale Station” looks at race relations and misunderstanding during a time when everyone has a cell phone that can record everything and then be sent everywhere. What “Fruitvale Station” neglects to explore is how easy it is to misinterpret something when watching it on such a tiny screen. “Fruitvale Station” definitely does justice to Oscar Grant. Bringing a tragedy such as this one to light is one of the most important functions that any film can offer. Yet, when a film only asks one-sided questions, it falls into the trap of reenactment. This entry was posted in Fruitvale Station, Michael B. Jordan, Movie Review, Octavia Spencer, Oscar Grant, Ryan Coogler on August 8, 2013 by ian0592.